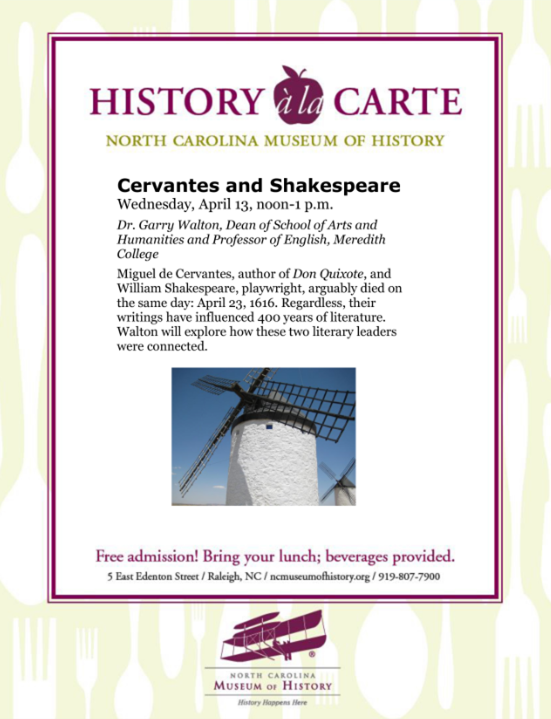 Special Guest DR. Garry Walton talks about Cervantes- Don Quixote and the special connection between Miguel De Cervantes Saavedra and William Shakespeare. Join us at the NC HISTORY MUSEUM, at noon, on the second Wednesday of each month and have a little history with your lunch! History à la Carte is a series of 50-minute informal lectures about a variety of historical topics—come learn about the Civil War, North Carolina pottery, the lost colonists, famous North Carolinians! You bring your lunch; we provide a small assortment of drinks! Dr. Garry Walton joined the Meredith College faculty in 1983, after studying at both the Shakespeare Institute of the University of Birmingham in England and the Folger Shakespeare Library in Washington DC and completing his PhD at the University of Virginia. In his 33 years at Meredith he has taught courses in writing and British literature, focusing on Milton and Shakespeare. He directed the college Honors program and served as head of the Department of English before assuming his present position as Dean of the School of Arts and Humanities. He has been named an outstanding teacher and adviser by the college and was named Outstanding College English Teacher by the South Atlantic Modern Language Association. His scholarly publications have focused on Shakespeare, literary theory, and pedagogy.